Despite the naming similarity, there is a world of difference between Sigma’s 35mm f/1.4 and its 30mm f/1.4 (reviewed here). Whereas the former is a full-frame lens, the latter is APS-C only; whereas the former has a petal-shape lens hood, the latter’s is cylindrical; whereas the former offers stunning image quality in all respects, the latter is excellent only in parts. Significantly, the price of the 30mm lens is little more than half that of the 35mm so maybe these differences are not only understandable but also acceptable. Sigma’s new A-series 30mm succeeds the company’s EX lens with the same maximum aperture: buyers should be aware that previous-generation Sigma lenses were supplied in black boxes whereas the latest A-series lenses come in white boxes. Confirming the respect that should be shown to such lenses, and in line with the philosophy for EX lenses previously, Sigma includes a padded carrying case as well as a lens hood in the box. “A” stands for Art and indicates that the new 30mm’s design prioritises quality and ergonomics above compactness and multi-functionality. On first glance the lens looks under-stated to the point of being plain but it feels solid and locks onto the host camera body with a reassuring slide-and-click before nestling very comfortably in the hand during use. There is a nicely-proportioned manual-focussing ring towards the front and a focussed-distance window mid-barrel with an AF/MF switch below: although the lens hood blocks the focussing ring when stowed, both controls fall easily to hand when the lens is in use. The focussing ring remains static in AF mode but can be used at any time to make manual adjustments. Automatic focussing is exceptionally quiet but not as fast as was observed for the 35mm lens, which was evaluated using a Nikon D700 versus the D80 used here. Technical testing revealed excellent sharpness, above 0.25 cycles-per-pixel right across the aperture range, but with some clear signs of chromatic aberration on the high-contrast test targets. In the field, however, colour fringes were not a problem although a significant amount of barrel distortion was observed. 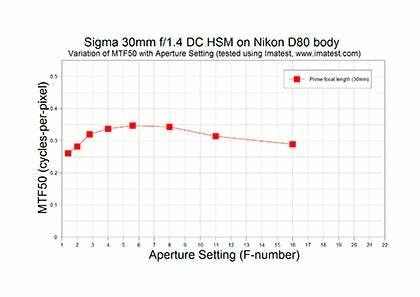 Sigma identifies only one special element within the 30mm lens: the rearmost element features a double aspheric profile that is said to minimise spherical distortion, astigmatism and coma. The rear six elements (two of which form the only compound group in the lens) move during focussing, meaning that there is neither extension nor rotation at the front of the lens. This could be significant when using polarising filters and Sigma suggests that it also helps to maintain constant balance but in a lens this short that is only a minor consideration. Sigma’s online data acknowledge the distortion noted above and also show a high level of vignetting at f/1.4 but vignetting come sometimes enhance an image – which is rarely the case for geometrical distortion.